An outdoor pool free Wi-Fi and in-room microwaves and refrigerators make the Deluxe Motel a convenient place to relax for the night near I-10 and a wide variety of dining options. 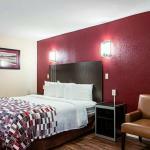 The two-story Deluxe Motel offers 95 air-conditioned rooms with free Wi-Fi cable TVs microwaves and mini-fridges. Make a splash in the outdoor pool or play some pool in the on-site lounge which includes a billiards table. Copy and fax services are available in the business center. There's an on-site guest laundry. Pets are welcome. Parking is free. Non-smoking rooms are available. The hotel is located on Highway 190 at the intersection of I-10 a half-hour from downtown New Orleans the French Quarter and the Superdome. Catch a swamp tour 10 minutes from the hotel. Nature enthusiasts shouldn't miss Bayou Sauvage National Wildlife Refuge 20 minutes away. NASA's Stennis Space Center is 30 minutes away. Ochsner Medial Center Southern Surgical Hospital and Slidel Memorial Hospital are five minutes from the hotel. The Slidell Amtrak Station is two miles away Stennis International Airport is 19 miles away and Louis Armstrong New Orleans International Airport is 37 miles from the hotel.